In honor of St. Patrick’s Day, an excerpt from Rebel of ’61. We of the WCHT are proud to fulfill Joseph Stonebraker’s wishes. We located a copy of this very rare, almost-200-year-old poem! We are even more proud that the poem, in it’s entirety, is reprint in the WCHT 2016 annotated edition of Rebel of ’61. All proceeds from the sale of this book will be used to further preservation efforts in Washington County. In The Battle of Funks-Town all are equally satirized by Kennedy’s pen. The Irish are riotous, drunken “Shamrocks,” while the German-born Funkstown residents are “son of crouts.” The local ladies are humorously mocked as they “scampered up and down” the streets with bonnets and lacy ruffles flapping, shouting for the local magistrate to restore order. 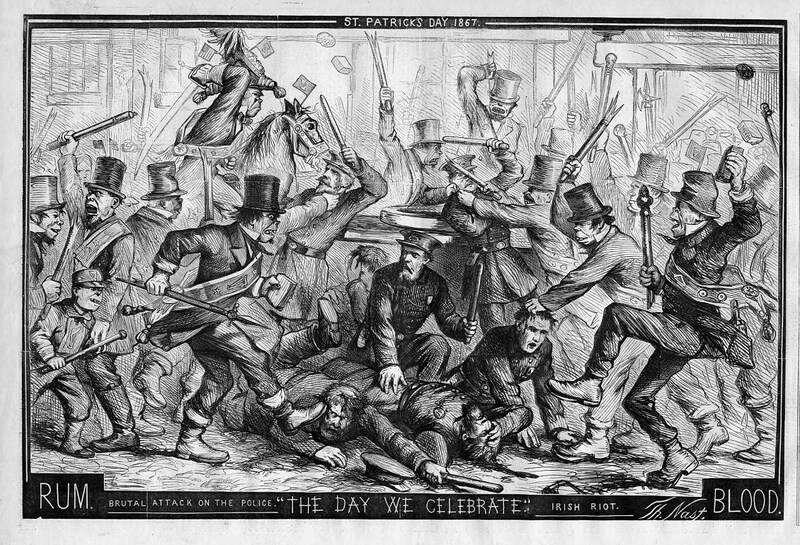 The St. Patrick’s Day fiasco begins on Sunday evening, March 16, 1823, at a tavern along the National Pike near Funkstown when an instigator hangs a “Paddy” on the hotel sign post. A Paddy is a life-sized, straw-stuffed figure decorated with anti-Irish symbolism. A Paddy usually sported ape-like features, and was decorated with strings of potatoes, mackerel, and liquor bottles; the entire caricature designed with the intent to annoy the Irish. This particular Paddy had been fashioned with “dye sticks” for arms, reported to have been provided by a Funkstown Antietam woolen factory employee. 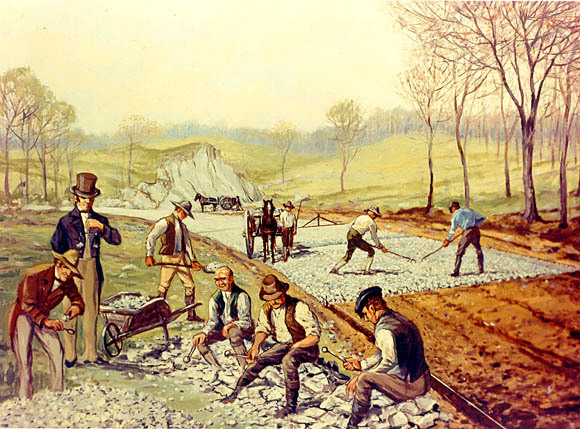 In 1823, a community of approximately 200-300 transient Irish workers lived in a make-shift village south of Funkstown known locally as “Cork.” The workers had been hired to complete the National Turnpike from Boonsboro to Hagerstown. Named for County Cork, Ireland, Stonebraker identifies Cork as “just east of where the National pike makes a turn, and the houses along the road which leads to Beaver Creek.” This description places the village of Cork somewhere along present day Cool Hollow Road. Today there is no evidence that the village of Cork ever existed. 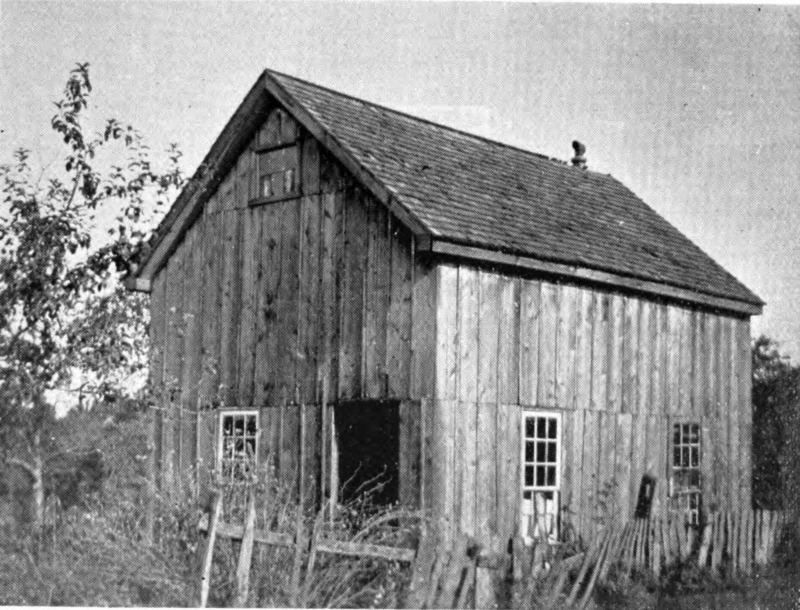 Stonebraker’s 1890s photo of a “Shanty in Cork” that appeared in Rebel of ‘61 is the only known photo of a dwelling in that village. 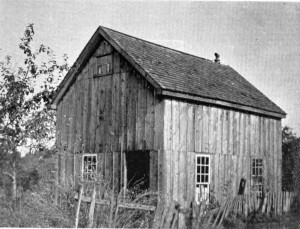 In the early 1820s, Funkstown was a small village in rural Washington County occupied by about 500-600 residents of predominantly German and English heritage; all industrious, hard-working solid Lutherans, Episcopalians, and Methodists. The economic and social impact of 200-300 Irish migrant turnpike workers living in temporary housing just three miles south of town cannot be overstated. These were not gentle, aristocratic Irish farmers such as Charles Carroll, signer of the Declaration of Independence. These Catholic Irish were tough, hard-working, hard-drinking, unskilled laborers, who had fled even harsher times in Ireland. They were like nothing the local population had ever encountered, especially in such a large quantity. Stonebraker’s account of the battle (the recollections of the elder citizens of Funkstown) gives a much better accounting of the Yager riflemen’s actions. In this version the riflemen barricade themselves in the factory with men stationed at each window, ready to defend the property with their lives. The truth is probably a mixture of both versions and depends on who was telling the story. Kennedy continues his humorous version of the tale with the town magistrate (likely Michael Isenminger) making a valiant attempt to bully the Irish into submission. “Vat for de tevil you com’d here,” he shouts, “I’ll send you puggers to de jail,” and he reads them the “riot act,” and warns them of the consequences of a civil disturbance. Meanwhile, a lone rider races Paul Revere-like through Hagerstown, shouting that Funkstown is being invaded. Unfortunately, the rider fails to make clear the cause of the threat, and the result is pandemonium. Many Hagerstown residents, believing the town is on fire, come charging out with ladders and buckets. Others interpret the alarm as a slave insurrection, or possibly even an Indian attack, and readied their firearms, prepared to defend their homes. The Hagerstown folks quickly recover from their confusion, and soon members of the local militia, and the “American Blues” Light Dragoon cavalry troop under the command of Captain Jacob Barr, charge to the rescue of Funkstown. The Irish rebels may have had no problem routing a few armed locals, but they were not a match for mounted, trained cavalrymen eager for a fight. After some skirmishing, and “parleying,” the militia forces secure “the high ground” in the town, disburse the mob, and restore order. The ring leaders of the mob are carted off to jail in Hagerstown, and some militia remain on guard for the remainder of the night, but no further disturbances are reported. Two days later, on March 19, 1823, the five suspected ringleaders of the Irish rebels appeared before the judge of the Circuit Court in Hagerstown. David Clagett and William Bishop bring charges of assault and battery against Ganett O’Donnell, Francis McAllion [M’Callion], Terence Saacy [Seacey], Patrick Rourk, and Thomas Crogan. While the court records are not clear as to the ruling of the court, the Torch Light reported that the accused were found guilty and fined five dollars each, plus the cost of prosecution.